Rob Asked: Hi there, great site! My question is on chinch bugs in my St. Augustine grass. My grass has died out and it looks to me like these bugs caused the damage. My adjacent neighbor had his lawn die out last year, then had it re-sodded, but it died out almost right away. Mine started to die off right after his. Can a common lawn service we both have transport chinch bugs and/or weed seeds from one lawn to the next? Seems odd my lawn was great for ten years and then dies off right after his... I just want to know if I should re-sod before my neighbor does?! Thanks in advance. Answer: Hello Rob. Concerning your neighbor's lawn, if it died quickly after the sod was put down, it may not have been due to chinch bugs. It depends on how soon after it was put down. Sod can go into shock when it is first put down, but with proper irrigation it should have shown signs of root development. If he didn't water it properly it could die. I don't know if this happened, but it can and does at times. I say this to hopefully put your mind at ease a little. However, if it was due to chinch bugs, here is how to check for chinch bug activity. Since they are insects, they can be seen in your grass. Carefully check the green grass at the edge of the damaged areas. Search at the point where the blades meet the stems. They tend to hide in that area. The bugs will steadily work outwards along the line where the damaged grass meets healthy grass. They will always move toward healthy grass. Remember that diseases can also kill lawns quickly, so identifying the problems is a crucial first step. Take a large metal coffee can with both ends cut out. Push and twist the can so it cuts into the grass to the soil line. Pour a mixture of water mixed with a small amount of dawn dish soap into the can. The bugs will float to the surface, if the water doesn't absorb too quickly. Look for an 1/8 inch long bug with silver/white wings that appear to give the wings an hour glass appearance. If it doesn't work, then continue searching the grass blades at the damaged edge to see if you find bugs. If you do, a lawn insect control product becomes necessary. If you find bugs at one spot, then assume they are the cause everywhere on the lawn. Work quickly by applying an insecticide labeled for chinch bugs. Read the label of your insecticide completely before applying. It may be helpful to know that it is not actually the bug's feeding that kills the grass, but rather is a chemical found in the it's saliva that is toxic to the plants. The Hairy Chinch Bug inhabits northern states and prefers turfgrass including Fescue, Bentgrass, Ryegrass, K. Bluegrass and Zoysiagrass. The Common Chinch Bug prefers grain crops but will feed upon turfgrasses. Their range is from South Dakota to Mid-Texas over to the east coast. There is also the "Southern Chinch Bug" and "Western Chinch Bug". There names indicate where they are found and feed on turfgrass. Southern Chinch Bug attacks St. Augustine and is a problem in Florida and is considered one of the most expensive insect problems in florida turfgrass. Yes, lawn service companies, especially if mowing when the grass is wet, can transport grass to another lawn. The grass sticks to the bottom of the mower when wet and can fall off in clumps on the next lawn. While this is a drawback to using a service, in Florida it is usually only a matter of time before insect damage will occur. It will be difficult to prove the lawn service is responsible since these insects are such a common problem in Florida. According to Florida experts on chinch bug research, most heavy damage occurs in May through October, but can occur year around. It depends a lot on temperature. 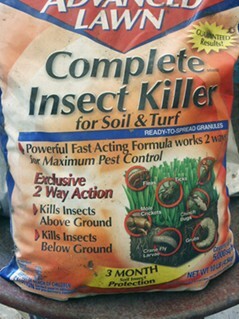 Again, applying an insect control product as soon as damage is seen is necessary to save your lawn. Voles are similar in some ways to lawn moles except the voles primary diet are plants. They eat roots, bark, flowers and any vegetation at ground level. Find out how to control these damaging pests. Using a preemergent herbicide is the most effective way of controlling crabgrass. Check out several questions from our visitors about their use. How do you kill crabgrass after it has spread? Read this question and answer on how to beat your crabgrass problem and make sure it doesn't come back.